This January, the European Commission (EC) announced it would investigate Microsoft’s bundling of Internet Explorer (IE) with Windows. The EC thought that perhaps throwing an IE in with every copy of Windows was harming competition between web browsers and reducing consumer choice. And you can see their point: Internet Explorer makes up 67.7% of the European browser market, and Firefox comes in second at 25.3% (as of Q1 2009). As Mozilla is an interested party in the browser market in Europe, Mitchell Baker created a list of potential principles to be followed in the EC case, which Microsoft drew on heavily in their settlement proposal. The third principle she wrote was that Windows must enable people to choose other browsers. In response to this, Microsoft came up with an all-American proposal: a vote! 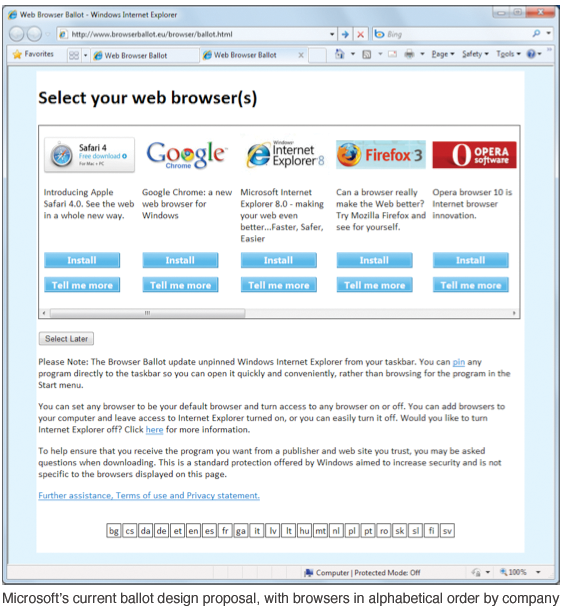 Give users a ballot in XP, Vista, and Windows 7, and let them pick the browser they want from a list. Liking the cut of that gib, the EC gave Microsoft the go-ahead begin formal market testing of the ballot. On October 7, the EC announced a formal settlement proposal. Awesome, right? A ballot is simply not a good way to create more “user choice” on the web. While literally giving users a choice, the ballot is unlikely to let users make an informed choice. A user simply can’t choose a browser that’s “right for them” based on a logo and a couple sentences. Side-by-side comparison works for items with easily comparable traits, like price or size or length of time. But browsing experience is just that: an experience. No one can rate experiences they’ve never had. Another problem with the ballot design, as Asa Dotzler points out, is that IE still has the advantage since pressing “Install” for any other browser besides IE means a long installation process that may make the user quit or cancel. In fact, only 57% of users who click “download Firefox” on the Mozilla website ever complete the installation, and those are people who know they actually want to use Firefox. Harvey Anderson addresses a few more concerns with the ballot, such as that it appears IE could become the default browser if the ballot is ignored or misunderstood. I won’t repeat his points, very sound. For now, since the EC seems to be moving forward with the ballot proposal, let’s consider how a ballot could be designed as well as possible. The current design that Microsoft has proposed includes a whopping 10-17 browsers to choose from. The five most popular (IE8, Firefox, Safari, Opera, and Chrome) would be grouped together on the first screen, and the rest would be visible if the user scrolls horizontally. At first, it was proposed that the browser be listed in order of market share (first IE, then Firefox, etc). However, since unfair market share is the reason the EC got hot and bothered in the first place, the current design puts the browsers in alphabetical order by name of the company that creates them. That means the first item is Apple Safari, then Google Chrome, etc. This ordering is about the worst option possible, both for user choice and the web as a whole. Microsoft wrote in their proposal that “nothing in the design and implementation of the Ballot Screen and the presentation of competing web browsers will express a bias for a Microsoft web browser or any other web browser,” but this is exactly what the current design does. Windows users presented with the current design will tend to make only two choices: IE because they are familiar with it, or Safari because it is the first item. Users selecting the IE logo because it is the image they associate with using the internet isn’t too surprising. After all, many users do not know or care that other browser are available. But the disproportionate advantage to Safari is what really makes this design poor. The problem is that for the user, screens such as this one are a roadblock to the task they they actually want to perform (in this case, using the internet). And, as Asa notes, the most common user behavior when confronted by a roadblock is to take the action they believe will most effectively remove it. Because of this, in user experience design it’s standard practice to present two paths through a setup: a well-marked “express” path of giant buttons and recommended options presented first in lists, and the “advanced” path for users interested in tailoring their configuration. This allows users who do not want to configure options to quickly get the setup that is designed for most people. By presenting Safari as the first item in a list, this ballot implies that it is the item recommended to most users. Compounded with this problem is the fact that first placement on a ballot gives an advantage even outside of computing. Daniel Ho and Kosuke Imai found by analyzing California election results that ballot order gives some advantage to major party candidates, but a huge advantage to minor party candidates who may increase their voter share by 50% simply by being listed first. The fact that the first item on the ballot gets an advantage isn’t really debated: many studies have confirmed this (Darcy 1986; Faas and Schoen 2007; Miller and Krosnick 1998; Koppel and Steen 2004; Gierzynski et al. 1997). And there are many reasons for this to be the case. Susan King Roth’s study of voting found that one reason for first-item preference is that western readers begin a visual scan on the top left of a page. When users are presented with unfamiliar tasks, such as an installation screen they’ve never encountered, they have expectations about how to approach it: they try to recognize patterns in the design from similar tasks they’ve completed. (Dillman and Jenkins (1995, 1997)) This is both why western readers begin visually at the top left of a new page, and defer to previous software installers they’ve seen in assuming the first item is the safe bet. Miller and Krosnick also cite the primacy effect as a reason people choose the first item: if given many possibilities, it is a natural response to choose the first one. So what’s so bad about presenting Safari as the first, recommended item? Aside from being unfair to the other browsers, the problem is that past consumer choice has shown that Safari does not provide an ideal browsing experience on Windows. Taking IE out of the equation because of its advantage as the bundled browser, the free market really does show what Windows users prefer. Safari has the smallest market share of the five other browsers at 2.6%. Frankly, Safari is a good browser for Apple computers, but Apple hasn’t put much effort to make it competitive on Windows. It’s just not their priority. So, by listing Safari first, the ballot is presenting as the recommended item the browser that is least likely to be the one the user wants. This leads to users having a bad experience using the web, and ultimately hurts the user and the market. A randomized ballot would have the benefit by giving no browser the significant advantage of the first spot. It unfortunately does not provide users with any information about what browsers are preferred, but at least it does not give undue advantage to an unpopular browser each time as the current design does. Holding aside IE because of its bundling advantage, placing the browsers in order of popularity gives some guidance to the user. A user can’t truly judge if a browser is right for them from a couple lines and a logo, so knowing what other users have chosen is actually not the worst way to make a decision. This is essentially crowdsourcing: if 60% of users prefer a particular browser, there’s essentially a 60% chance that a particular user will prefer it. IE still gets the huge benefit of its logo, familiar to nearly everyone who will see the ballot. In fact, I predict this will be an even bigger factor than browser order. That’s why placing the IE logo last does not put it at a real disadvantage. I wanted to add one more option to this list that may be the strongest. It’s an idea I’d been knocking around for a couple days, which Wladimir Palant and Ben Morrow came up with independently: probability ordering by market share. For the first four spots, give each browser essentially the percentage chance of being first that they have of the total market share. So, Mozilla would be first about 50% of the time, Chrome would be first 30% of the time, Opera 15%, and Safari 5%. This allows for the market forces to have some weigh over placement, but doesn’t consistently benefit one browser. The problem is, it still puts some users at a disadvantage who randomly get a less popular browser as the first on the ballot.